The last thing you want to hear about is anything that sounds like it might increase or attract heat! But a “heat recovery ventilation” system is not what it probably sounds like. In fact, a heat recovery ventilator might be considered your hard-working A/C unit’s best friend and trusted assistant. In this post, learn why you should consider adding a heat recovery ventilation system to your HVAC unit’s components. Is Your Home or Workplace Sealed Up Too Tight? In the interest of creating the ultimate draft-free structure, builders have spent years refining architectural plans that now actually do their job too well. Far from the uncomfortably drafty structures of the 1970s and earlier, now homes and workplaces are sealed up tight. There is no fresh air coming into the buildings, which are beginning to fill up with stale, toxin-laden air instead. Of course, this was great for allergy doctors but not so good for employers and families. People were living better and feeling worse, and it is a problem that continues to get worse today. Today, our indoor air toxicity has reached levels up to 5 times higher than what we breathe in when we go outdoors. Yikes! What to do? Initially, it was thought that homes could be designed differently so they could ventilate themselves naturally. But often the weather wouldn’t cooperate (who wants to open windows when it is windless, hot, and humid outside? ), so builders moved to Plan B—mechanical ventilators. A mechanical ventilator gives homeowners and employers the ability to control ventilation and keep indoor air fresh and breathable regardless of what is going on with the weather outside. The heat recovery ventilator, often nicknamed the “air-to-air heat exchanger,” not only ensures the indoor air supply at home or work is fresh and regularly ventilated, but it also achieves greater energy efficiency in a way quite similar to how a car radiator works. 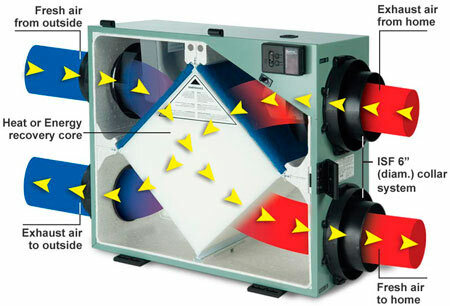 The core of the heat recovery ventilator is the heat exchange. In this central part of the unit, the heat is moved from one air source to the other as needed to maintain comfortable, seasonally appropriate temperature and humidity levels. In the winter, the heat exchange will pull heat from the outgoing stale indoor air. It will then use this heat to warm up the indoor air, reducing the need for your HVAC unit to work harder to heat incoming air. In the summer, the heat exchange will pull heat from the incoming fresh air and send it back outside with the stale outgoing air. In this way, heat recovery ventilation can accommodate the needs of any size space with few or many occupants in summer or winter. Whether your struggles have focused on trying to control dampness and humidity, health symptoms from increasing levels of indoor air toxins, or challenges when regulating temperature and airflow, a heat recovery ventilation system can help. A heat recovery ventilator can support your need for fresh indoor air whether you use a traditional ducted HVAC unit or a ductless unit. No more struggles with indoor humidity and dampness. Easier to keep damp rooms (bathroom, kitchen) clean and clear of mildew and mould. Noticeable lessening of respiratory, allergy, and asthma symptoms. No more unpleasant odors in areas of the house with especially poor ventilation. Air literally smells fresher and cleaner! Lower costs due to fewer visits to the doctor and allergist. Fewer employee sick days negatively impacting the bottom line. No more need to remediate for mould and mildew. Lower monthly energy costs because the humidity levels are now balanced. Savings from not having to purchase air fresheners to combat problematic odors. First, be sure to replace (or clean) your filters regularly! This saves you energy costs and keeps the most toxins out of your indoor air supply. Second, schedule a full HVAC preventative inspection and maintenance check at least annually. These checks more than pay for themselves by addressing small maintenance and repair needs before they become big expensive emergencies. Help! We Can’t Breathe in Our Own Space! Here at Shipton’s Heating & Cooling, we have nearly a century of expertise working with a complex array of indoor air issues. We highly recommend pairing a new or existing HVAC unit with a heat recovery ventilation system for both the health and cost benefits this partnership can offer you. 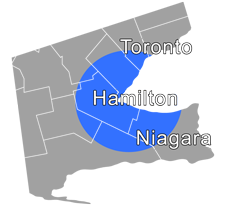 To learn more and schedule your complimentary consultation, you can reach us at 905-549-4616 or online here.